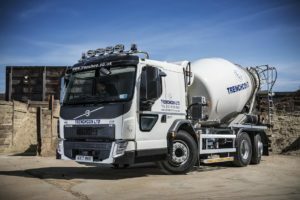 The government has made a further announcement to clarify the regulation of volumetric concrete mixers, which will fall in line with other HGVs beginning in September 2018. The existing legislation means that volumetric operators and drivers require no Operator Licence, no application of drivers’ hours or working time rules. According to the Mineral Products Association (MPA), four-axle volumetrics have been loaded in excess of 40 tonnes compared to the legal limit of 32 tonnes for HGVs. Under the new legislation volumetric operators will require Operator licences, drivers will have to abide by EU drivers’ hours and working time rules and volumetric concrete mixers will be subject to HGV testing requirements. Existing volumetrics will be able to operate under a temporary regime until March 2028 at the latest. MPA Executive Director Jerry McLaughlin commented “It is very positive that Transport Minister Jesse Norman MP and officials are now taking action which will bring the regulation of volumetric concrete mixers in line with other HGVs. The Minister’s decisions are a victory for road safety and common sense”.